Cortina d'Ampezzo, known as the Queen of the Dolomites and the Mecca of the Italian clebrity is the premier Italian ski resort. It sits in the same exclusivity bracket as Courchevel 1850, Gstaad, Zermatt, St Moritz and Lech/Zurs. This is where affluent Italians head and is the location of many a second home. There is some of the most awesome scenery anywhere in the ski world, with great ambience in a classically Italian context, with shops, cafés, restaurants and hotels to rival the very best. Cortina is also a genuinely pretty town, with lots of activities for non-skiers. This is a very different style of resort than most of the Dolomites that are heavily influenced by their previous owners, the Austrian/Hungarians. Cortina is pure Italian style. Many Italians don't even go there to ski. It is a place to parade, shop, and most importantly to lunch. Lunch here is a serious event and the slopes are empty after 2pm. Many of the Mountain restaurants can be reached by road so the fur coat brigade get there early and while away the day sunbathing and cruising their phones. If you want to eat outside on a sunny day I recommend getting your spot by 11.45am. There are superb, well-groomed pistes for beginners and intermediates to enjoy on their ski holidays in Cortina, slopes are guaranteed to be perfectly groomed. 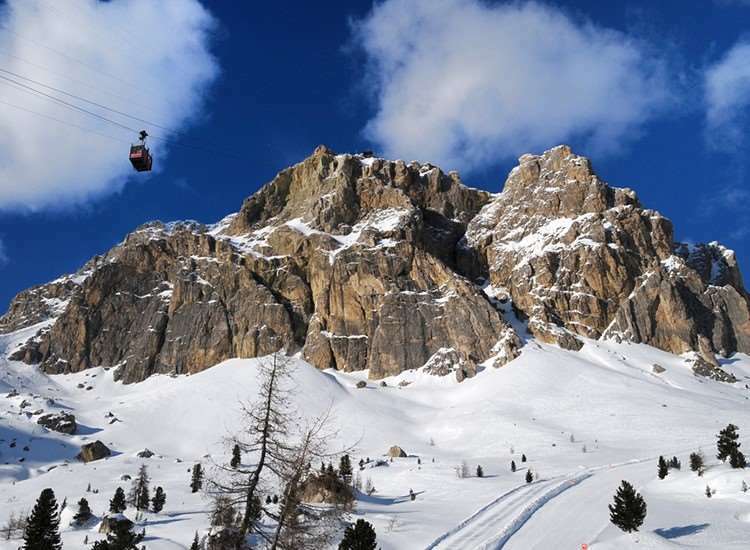 The local skiing for those on ski holidays in Cortina is extensive and varied with other resorts such as S.Cassiano and Corvara in the Dolomiti Superski area easily reached in 30 minutes from the Falzarego pass. Most guests will take a day out to do the Sella Ronda route either clockwise or anti-clockwise. It is easier and cruisier going Clockwise but good skiers should opt to go anti-clockwise for a few more challenges and greater views. 90% of the pistes are covered in snow making facilities which adds to the natural snowfall for more guaranteed skiing throughout the season. Hotel de la Poste or the Enoteca or Osteria Wine Bars for aperitifs · Try the Clipper Bar and the American Bar in the centre of town. Night owls will favour the Blu Room or Hyppo discos. Aprés ski is more about wandering the town and popping into little bars for an apéritif than dancing on tables. It can still be lively but not to the same extent as resorts like Selva. Well over 40 restaurants cater for all tastes and budgets · Croda Café, La Perla, Ariston or Tre Cime for super pizzas. Le Cinque Torri owned by Olympic skier Kristian Ghedina for excellent pasta dishes, Beppe Sello, El Toula or Leone e Anna for more luxury. 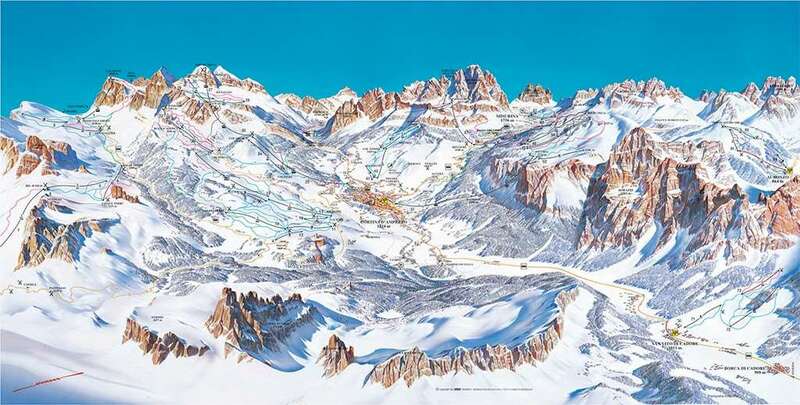 The closest international airports to Cortina d'Ampezzo ski resort are Venice Treviso and Venice Marco Polo, which are both within a two hour bus or car transfer away. Innsbruck, Austria, is also convenient for travelling to Cortina. Our holiday started at the end of January, not much snow to start with but things improved as the week went on. The Victoria Hotel was a lovely place to stay for the week. Lovely accommodation and evening meals where tasty and plentiful. Whilst we enjoyed the skiing it is limited and we felt that references made during the booking process that suggested our dolomiti superski pass would enable us to ski far and wide we’re misleading as this resort is NOT linked to the sella Ronda unless you wish to get a bus in the morning and the one and only bus back at 60clock ish. That said all skiing in this location can only be accessed via the ski bus.